Day by Day, retailers are taking their business to online to grow their business but the question is “Will it be enough to attract the customers to store?” No obviously not! 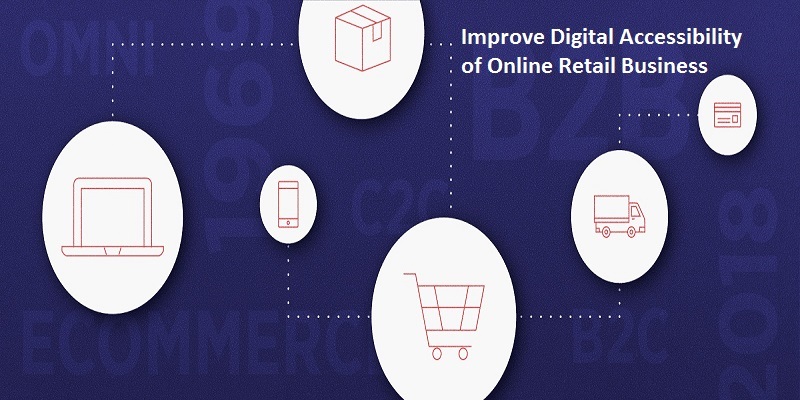 There are so many things physical and online retailers can do to improve the experience of customers or shoppers, especially online retailers. Today store owners are adapting the changes to make shopping easy and enjoyable. So now let’s talk about what things you need to do to improve the digital accessibility of online retail business. Use Large Font Size and High Colour Contrast: This is a self-explaining tip, but you need to make sure your font size is sufficiently large to be readable. Some text may be small (such as fine printing), but by default you shouldn't have small font sizes. And always make sure that font colours are not much similar to the background colour or having low contrast. This might reflect the issues for many people and on many devices as well. For e.g., Grey text might look great on white background on the 27” iMac pro screen, but this won’t appear same for all. Never Remove Outline Properties: A glowing line can appear around your element when you use your outline property-whether this is a form field, button or link. Many online stores remove this because it might look ugly, but accessibility can be bad. If you don't have a mouse or have difficulty using a mouse device, you can use your keyboard or keystrokes to navigate the site. But if you remove the glowing outline, these users won't know where they are on site or which buttons they navigate. Add Proper Alt Attribute to Images: Make sure you always add an alt tag to describe what the image is when uploading images to your site. Many screen readers use the alt tag for visually impaired people, so this is descriptive and concise. Your products can have multiple product images for e-commerce sites, so each image must have an appropriate alt tag for those who rely on it to distinguish. Give Proper Label to Form Fields: It appears to be a common theme for form fields to be visually described with their placeholder text-the gray text in the box that disappears when you start typing. That's not only visually confusing (especially once all form fields have been completed), it also does not provide a reference point for people using voice-to-text software. If you have to give up labels, make sure that they are only visually hidden (for the technically inclined, check this resource on display: none); don't rely on the text of the placeholder! Use Native HTML if Possible: Some native elements with default styles (dropdowns are a common example) don't look great on a page, so they are often restyled. Unfortunately, for many users who use keyboards and keystrokes to navigate through a site, restyled elements often don't actually work very well. It also ensures that we do not reinvent the proverbial wheel by sticking to existing elements! This barely scratches the surface of things online retailers can do to make their websites fully accessible; we have not even touched on access to slower networks or multiple device testing! Even with a pre-existing site, however, these should be something that can be implemented relatively easily to make your site easier to use immediately. The core motive of above topics is only that never ignore these small elements of website analysis. Usually, online retailers makes their stores attractive but has these little lacunas so make sure you don’t make these mistakes. Otherwise if you are looking for website redesign services or web designing services in India to make digitally accessible to customers then contact us at W3care Technologies. We have an experienced team of web designers.